Across Iowa, it’s people who are building a new green infrastructure to improve water quality. Across Iowa, it’s people who are building a new green infrastructure to improve water quality. People like landscaper Lucy Hershberger, who took a Master Conservation class and told North Liberty city leader Tracey Mulcahey about a state grant program to restore lawn soils. People like farmer Dean Sponheim of Nora Springs who describes himself as an “accidental environmentalist,” who discovered saving money with strip tillage also saves soil. Today, Sponheim is the point man for an array of new services farmers are using in the Rock Creek Water Watershed project. As farmers, soil scientists, engineers, pilots and a myriad of other experts implement the Iowa Nutrient Reduction Strategy, economic opportunities are unfolding in Iowa’s communities. This article highlights examples of why a host of Iowa leaders have joined us in a Conservation Infrastructure effort. Over the coming 18 months, teams will be working to uncover other opportunities for improving water quality – aligned with the Iowa Nutrient Reduction Strategy – and to identify the economic development opportunities that come with it for Iowa farmers businesses and communities. Dean Sponheim has developed a business to serve other area farmers who are working to improve water quality using conservation practices. For more than a quarter century, Osage, Iowa, farmer Wayne Fredericks has been at the forefront of testing soil and resource-saving technology. What might have been unusual decades ago is now becoming more noticeable almost three years after the nearly 45,000-acre Rock Creek Watershed Project that started in July, 2014 in his area. 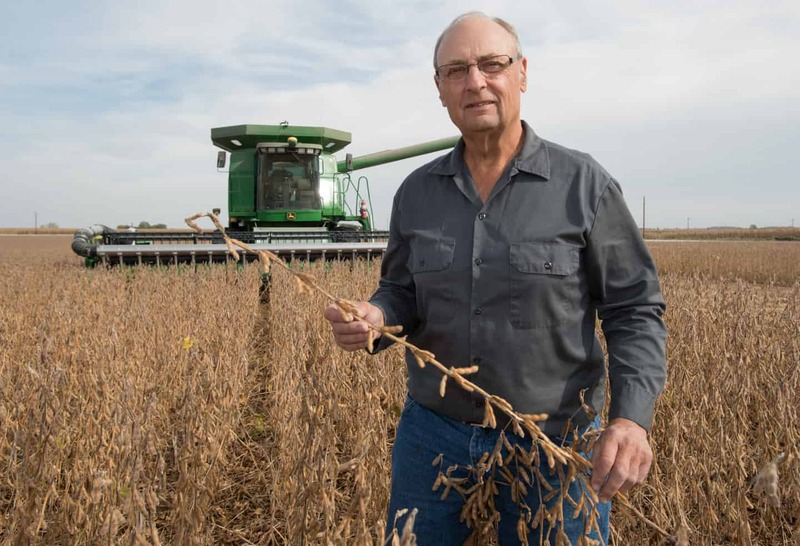 “The practices that we’ve established—no-till, strip till and cover crops, are quite visible,” says Fredericks, a past president of the Iowa Soybean Association. ISA has estimated that farmers in the watershed are already 85 percent toward their five year goals, with some 4,000 acres seeded to cover crops last year and other practices like bioreactors being installed. A lot of things contributed to the momentum: a watershed plan – the first in Iowa designed to achieve the Iowa Nutrient Reduction Strategy goals – driven by farmers and landowners and a mix of private, state and federal grants to help pay for practices; in addition to technical experts working alongside farmers. Because more changes are showing up in the watershed, farmers are willing to try them and Fredericks fields, “don’t stick out like a sore thumb,” he says. But a key, in Fredericks mind, is a growing network of local businesses that support these changes. “We’re just kind of seeing this thing mushroom,” says Fredericks, who also became the first grower in the area to install a bioreactor last summer. Fredericks credits fellow farmer, Dean Sponheim of Nora Springs with leading many of the changes. Long before the watershed project started, Sponheim adopted strip tillage, mainly to save input costs. He began a custom tillage business for some of his neighbors. Since the watershed project began, Sponheim is now operating two machines. “We’re probably doing around 12,000 to 15,000 acres” in the watershed, he says. Another local farm supply business provides the same service. Neither can completely meet the demand, so some farmers have bought their own strip tillage equipment. “We’ve actually started six people,” says Sponheim. “My goal is to help start people and get them headed on the right track where they can be successful,” he says. 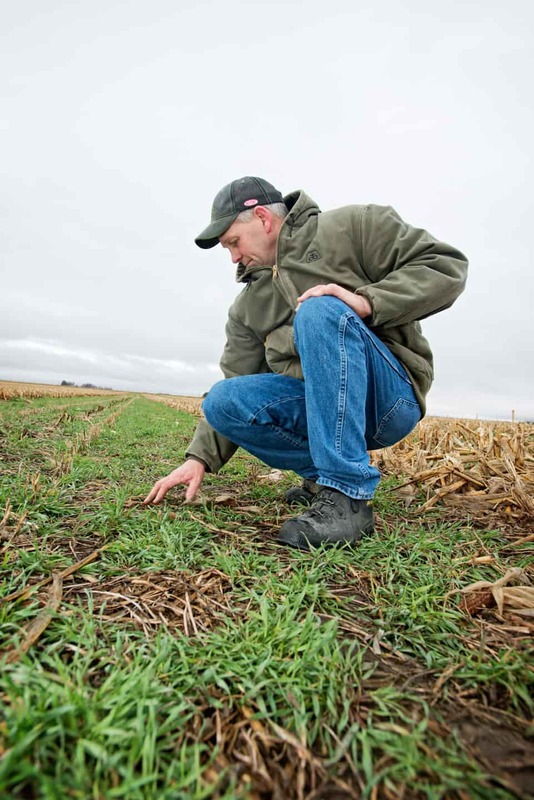 Through his custom business, Sponheim Sales and Services, Sponheim also is coordinating local cereal rye seed production to meet growing demand for cover crops. “We have seven customers right now that are custom growing for us,” he says, “and as demand increases we’ll have more growers growing for us.” Last year those growers planted some 350 acres of rye for seed. Local aerial applicators have helped seed rye by air. But some farmers prefer to have the cover crop seed drilled. And now, two young farmers are working with Sponheim to provide that service as well. Following combines at harvest, they seeded a little more than 3,000 acres last fall. Wayne Fredericks has been at the forefront of testing soil and resource-saving technology. Sponheim and other local support businesses also work through Rock Creek Project coordinator Tracy Church and Rachel Amundson. “We do the mapping for the aerial or the drilling and we supply all the seed,” Sponheim says. Both Sponheim and Fredericks see the potential for more contractors to build bioreactors and other edge-of field practices in the future. “There’s a lot of tile outlets that need filtering,” Sponheim says. As more land is planted to rye over the winter, Sponheim believes that may lead to winter grazing that could bring $50 to $100 an acre. “It could lead into some very nice enterprises for young guys—or anybody,” he says. Of course, there are few fences left to hold those expected cattle. But that’s another potential business—building permanent or temporary fencing. “There’s endless opportunity here, I think,” Sponheim says.